CAR ORCR LOAN SANGLA WITHOUT TAKING YOUR CAR – GET UP to 2M LOAN APPLY NOW! Also called the OR CR loan, our “car loan without taking your car“ is a guaranteed top collateral loan product at LoanPh.Com. The reason? Convenience, fast approval highest appraisal value for your vehicle. ORCR Sangla also offers convenience to loan borrowers because they can still use their vehicle for business, office, travel or work. 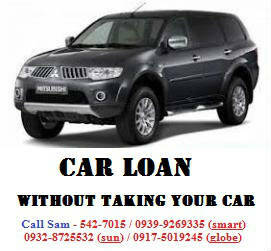 This secured loan in the Philippines is definitely the best option for vehicle owners who need fast cash. Apply to us and you get guaranteed lowest interest rate possible through our affiliate bank lenders and top loan providers in the Philippines. Because of this, we can now process your car loan as fast as up to 1 day release provided you have the complete and correct requirements to submit plus if you will start your auto loan application process the earliest possible before 9:00 AM. We have achieved this countless times for our previous clients and we can also do it for you. All you have to do is just be extra patient for a whole day availability in processing your loan. 100% FREE car loan consultation and assistance. NO AGENT’S FEE OR BROKER’S FEE. You won’t get deduction in your loan proceeds for us to earn. We get compensated by the company providers we have affiliation/partnership ties with. GUARANTEED HIGHEST POSSIBLE APPRAISAL FOR YOUR CAR VALUE for higher loanable amount while achieving lowest interest rate. MULTIPLE VEHICLE LOAN PRODUCT CHOICES – without taking car / or cr only, brand new car financing, second hand car buy financing, car loan takeout / buyout, refinancing, impounding, taxi loan, puj / jeepney loan, delivery truck loan, heavy equipment collateral, muticab and tricycle loan. FLEXIBLE LOAN PAYMENT TERMS – starting at 12 months term. Can be raised up to 24 or 36 months (subject to process and company approval). LOWEST INTEREST RATE FOR 2010 YEAR MODEL and UP VEHICLE at less than 1.25% (subject for pre-qualification terms). 2% interest / 2000-2009 – interest rate only. ACCEPTS 2000 CAR MODEL and UP. HIGHEST LOANABLE AMOUNT EQUITY – up to as much as 80% fair market value standards based from existing second hand car sellers price online. ONLINE APPLICATION AVAILABLE – FILL UP HERE. MORE THAN 50 BRANCHES NATIONWIDE to cater to your ORCR sangla or car title loan. ALLOWS CAR REFINANCING AND TAKEOUT LOAN – get extra cash for your car while saving it from property foreclosure with banks or other private lending who gave you high interest rates. Must have a regular source of income – with work, with business, with monthly remittance, with apartment for rent, with small business or with a nearest relative with source of income to use as co-maker if borrower doesn’t have income source. Original OR CR must be under the borrower’s name. SPA is required for nearest relative authorized borrowers. Encumbered OR CR or if under bank or private financing (newly fully paid), owner must secure “release of chattel mortgage” or certificate of full payment and PN or promissory note from the bank or financing company. Those with absolute deed of sale and second, third and fourth owners may apply while processing change name in LTO or avail transfer of ownership from us for a minimal fee. Those with minimal or no proof of income may apply thru our private financier provider who have been serving us for more than 20 years now and can be trusted. People who have been declined or not allowed by banks and financing companies to apply for private vehicle collateral loan like lawyers, police officers, media personnel, with relative of the likes previously mentioned, foreigners, brother Muslims, owners of corporate or company vehicles, need immediate fast cash in 1-3 hours and willing to impound or leave car, are all allowed ask us how – (with Viber) 0905-4249367 (Globe) / 542-8105(PLDT) (Vina). Completely filled up application form – FILL UP HERE. OR CR must be under borrower’s name / Absolute deed of sale allowed / encumbered OR CR allowed / SPA (red-ribbon) allowed for nearest relative owner not in Philippines living or working abroad. Original proof of billing (only electric or water bill allowed) – doesn’t matter if bill is not under borrower’s name. If borrower does not have a source of income, please provide a nearest relative co-maker. Same requirements for proof of income applies as stated in #9 requirement above. If car is under financing or is encumbered in a bank, we can offer you car loan takeout or buyout. 70%-80% payment made in financing is required. This is ideal for those who can’t pay for the monthly amortization anymore and would like to prevent foreclosure of property or ending up in cmap bad credit with banks plus you can get extra cash from the excess value in your loan financed by us. Borrowers with own checking account and established source of income is an advantage for faster approval but is not necessary. We will refer you to the bank and you will get your own checking account in this case for less than 30 minutes. This year 2017, we no longer require checking account for loan 300K or less – payment is thru authorized / accredited money remittance centers only like Cebuana Lhuilier, M Lhuilier, 7-11 stores, Palawan Express, EC Pay gateway and more.